Symbolised Playscripts are a way of providing a differentiated resource allowing pupils with limited reading skills to participate in group and class activities. The supported text provides visual clues and prompts which make the text more accessible. This increases confidence levels of pupils and enables inclusion in class activities. 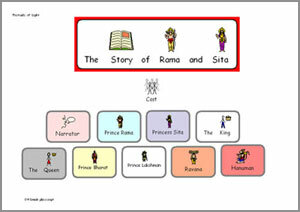 Playscripts are available in all the Traditional Story packs and the Diwali pack, which has a playscript of the Rama and Sita story. Playscripts are a way of telling a story in the form of a play. There will be a number of identified characters and sometimes a narrator who fills in details of the story. What each character says is printed in the order it happens in the story with appropriate stage directions. Playscripts can be used to read with small groups where each pupil takes on the role one of the characters. When the group becomes confident with their roles they may like to act it out for the class or another small group.